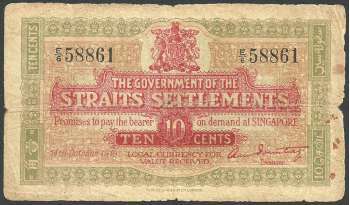 On the 5th October 1917, the Straits Government issued an official Government Gazette notice number 1313 (The Legal Tender Enactment 1913 and Amendment Enactment 1917) announcing the intention of issuing the 10 cents banknote to counter the shortage of coins in the Straits Settlements. Second issue was to be used along side with first issue. Despite the printed date of 14 October 1919 on the banknote, but it was only until 22 April 1920 it was put into the circulation. 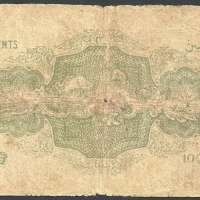 These banknotes were printed on proper India paper and were engraved in London by Thomad de la Rue and Co, Ltd. The serial number appears in black at the two top corners of the note. 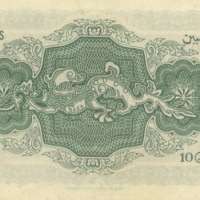 On the back of the note appears the representation of a dragon in white and plage green. By 22 September 1920, the value of these notes issued was $680,000 - it means that 6,800,000 pieces were in circulation. 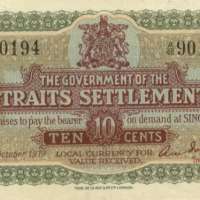 Due to silver shortage, as most of the silver went to melting pot once they arrive in China coast due to the intrinsic value of the metal exceed the face value, the Government of Straits Settlements vide ‘The Legal Tender Enactment 1913 and Amendment Enactment 1917’ allowing them to issue Emergency Banknote with face values of 10 and 25 cents. Exist only in one different signature variety. Issued on 14 October 1919 along side with first issues. The signature of the Treasurer of the Straits Settlement, Honorary Mr. A. M. Pountney, C.B.E.. Folded into 2 vertically and 1 horizontally. In poor to good condition. 3 major holes on the insection of folded areas. A big gratitude to Canggun Mendonan (Azman Alias) for letting me having a piece of this note in my collection. His help and patience is very much appreciated. THE GOVERNMENT OF THE STRAITS SETTLEMENTS, Journal of the Straits Branch of the Royal Asiatic Society, No. 85 (1922), pp. 126-134 Published by: Malaysian Branch of the Royal Asiatic Society.